I would like to thank Bookouture for my copy of this book via Netgalley in return for my honest review. Nadine is not so happily married to Jake. When an unexpected teenage pregnancy forced the couple to get married, it changed both their lives for the worse. Now that their four children have grown up and flown the nest, all Nadine and Jake are left with is a failing business and a huge house they can no longer afford. The couple soon decide that the only way for them to be truly happy is to divorce, so each one can follow their dreams. But they are in the middle of a recession and find themselves sharing a house which is split into two apartments. When living under the same roof becomes too much to handle, Nadine travels to Alaska, while Jake dreams of reuniting the band that made him famous before he got married. Jake meets Karin Moylan and begins a steamy affair, but he is unaware of the dark past Karin shares with Nadine. Karin coming back into their lives soon releases skeletons from the closet, and they find themselves reliving memories they would sooner forget. The Betrayal is told from the point of view of both Nadine and Jake. Told in several parts, the story goes back and forward through time. At the beginning of the book, we are told that something bad has happened to Nadine in the past, so going back in time helped to develop this story and really gave it legs. It also shows us the relationships Nadine and Karin had when they were teenagers. The story moves forward in time at a great pace and really holds your attention. It cover all bases with both characters and I loved how it changed between the point of view of Nadine and Jake. I adored being able to hear the story from both viewpoints and if anything it helped me to like these two characters even more. There is an air of mystery to this book, which made it all the more enjoyable. Although this book keeps you guessing and on the edge of your seat, there is a deep emotional side it also. My heart broke for Nadine and Jake when they decided to separate, because it was very evident that they still loved and cared for each a lot. The thing I loved most about this book was the striking contrast between darkness and light. You are fully aware at all times that something terrible has happened in the past, yet you can't help but warm to the story. The characters of Nadine and Jake are so likable, that I nearly didn’t want to find out what happened. Laura Elliot has a great talent for being able to write this contrast so beautifully. Nadine is by far my favorite character in this book I loved how strong and independent she was throughout the book. After everything she has been through she continues to pick herself up and dust herself off time and time again, She handles herself and her divorce with grace and dignity and she is definitely a character to be admired. I also loved the character of Jake. I almost felt sorry for him, because at times it felt like he was losing everything. Being able to see the story from his point of view, definitely made me warm to him more and more as the story progressed. Karin is the character that everyone will love to hate. She really is wonderfully written, and her confidence seems to just ooze off the page. Bookouture, in my opinion, are the best publishers around at the moment. The continue to produce great books by great authors and I think that The Betrayal and Laura Elliot are at the top of that list. I was astounded at how the book ended! Not many books make me say wow at the end, but this one has me repeating it. It is an ending that you won't see coming in a million years. The Betrayal is utterly compelling and gripping. It will get into your head and you will become immersed in the story from the very first page. A wonderfully written page turner. A must read. Can you tell us a little bit about your latest book, The Betrayal? The Betrayal began life as a rom-com. I imagined writing it quickly and enjoying the experience. However, it changed direction and the more I progressed with it the edgier it became. It was turning into something of a hybrid – a mix of dark and light – and, somehow, the two strands were not working together. After months of work I had to go back to the drawing board and decide – rom-com or psychological thriller? I opted for the latter. What is your typical writing day like? Do you have set hours or do you just write when you get the chance? I try to keep to an ordered routine and work most days, starting early in the morning and working until about four in the afternoon. Sometimes – when I’m working well, I’ll do a few hours at night but I’m a lark by nature and the morning is my best time. Where did you get the inspiration for The Betrayal? As I mentioned earlier – the story evolved from one genre to another – and the inspiration, came during Ireland’s economic crash when many couples - whose marriages were not working - wanted to separate. But the property market was in tatters and I heard about a number of couples who divided their house into two separate units and tried to live apart. The tensions that must have been involved in this arrangement intrigued me and I decided to explore what it could be like. Did you know how the book was going to end before you started writing, or did you let the story develop as you wrote it? Definitely the story developed as I wrote. I knew that something dramatic was going to happen to the couple, Nadine and Jake, at the end – but I’d absolutely no idea what that would be until I was about three-quarters way through the story. Did you always want to write tense psychological thriller type books? I didn’t set out to do so – but all my books tend to go in that direction. I like the challenge of creating a challenging situation and weaving a story around it. The Betrayal is filled with very interesting characters. Which was your favorite to write? I felt differently about all of them. I liked Nadine the best, enjoyed Eleanor, was challenged by Karin and had a soft spot for the hapless Jake. Too long. I’d constant interruptions, including a commission to ghost write a book, just when I was getting into my stride. And the fact that I went back to the drawing board also delayed me. I’d say it took about eighteen months before I had the first draft completed to my satisfaction. Then the redrafting began and I’ve been working non-stop since the new year to finish it. What can we expect from you in the future? Are you currently working on book number 4? I’m toying with ideas but have not started anything yet. I’m going on a holiday and will probably begin a new book when I return. How are you going to celebrate on Publication Day? I’m heading off on holidays early on Saturday morning so I’ll be going easy on the champagne. I’ll probably have a few drinks in my local with my husband – and a nice meal afterwards. I’m also looking forward to interacting with readers and reviewers on social media. 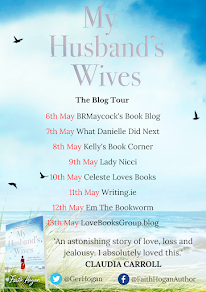 Thank you to Laura Elliot for taking the time to answer my questions and to Kim at Bookouture for arranging the interview.